Children play and learn in different ways but encouraging and nurturing their imagination from a young age can aid in their development and help them to flourish as they grow. If you have two children, you may notice one enjoys getting messy, playing with food and paint, and anything that is put in front of him, whilst the other will quietly pick up a pencil and draw when nobody is looking. Everyone has a creative side and every child needs the opportunity to find their own creative outlet. Here is how you can nurture and encourage your young child’s imagination. The most important part of imaginative play is getting messy! Your child needs to have no boundaries when it comes to imagination and this is why you need to provide a safe and clean place to let them do as they please. This means not giving them paints in your kitchen then worrying they are going to splash it all over your new furniture! Instead, find an old bed sheet to put down so they can play freely. The more you worry or lose your temper, the less they will want to bring their imagination out and play does not become fun. Of course, we don’t want them running around the house drawing all over everything, so finding a space specifically for messy play allows everyone to relax and have fun. Messy play is great in the garden on a warm day, or there are plenty of toddler playgroups which encourage messy play. Just don’t dress them in any outfits that you don’t want to be ruined! As long as it is safe to do so, letting your child make their own choices will encourage their thought processes and imagination further. It doesn’t matter if they have just dipped their paintbrush in the blue and want to mix it with the black, this is how they will learn for themselves. Choices don’t just mean in regard to playing though; even simple choices such as what they wear for the day or which cup they drink out of can allow their own personality to come out further. 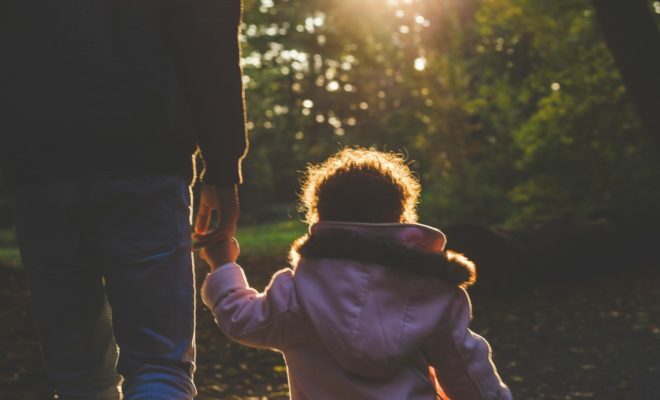 The choices we make in life determine who we are as a person, and even trivial choices such as these can help your child to learn who they are as they age. Although we should allow our children to be imaginative on their own, there are also times where we should join in too! There have been several studies carried out that have found children who participate in imaginative and creative play with their parents had broader vocabularies and were able to think more flexibly. The more you show an interest in their imagination, the more they will too! Encouragement is key, without pushing them to do something they do not want to do. When you join in with your child, they are required to multi-task and think about another person being involved in their play, so this will aid in their social and thinking skills. It also helps them to get ready for when they attend daycare and will be playing and sharing with other children. Those toddlers that like to play alone and are not used to playing with others will find the transition to daycare much more difficult. When we think about imaginative play, we think paints, play dough, and toys. A large part of a child’s imagination can be derived from books and as parents, we need to be teaching our children to read from a young age. Some children prefer reading to other forms of play, and this is a form of imagination in itself and certainly should be encouraged. Children that enjoy reading are often more critical thinkers and will find pleasure from traveling to other worlds in the form of books. Reading bedtime stories each night not only provides a great bedtime routine; it also allows your child to learn about many different aspects of life and further nurtures their imagination. Let your child choose their own books, and if they want to hear the same story for the hundredth time, read it to them! Even if you already have toys from your previous child being at a young age, this doesn’t necessarily mean that they are right for your next child. We are all different and some children enjoy messy play, whilst others enjoy playing with figurines. Young children like to explore the world around them, so providing plenty of different toys and play opportunities means you will find what works for them and allow them to discover what they enjoy doing. If you want to give your toddler lots of opportunities to try different materials, shop here for a painting easel that also doubles up as a chalkboard and allows you to attach paper, so your child’s drawing can be displayed on the fridge or on your wall! There are plenty of other imaginative toys to discover from dressing-up clothes to play dough to musical instruments, the more they can explore, the more their imagination will flourish. The most important thing to remember when letting your child be creative and imaginative is that it cannot be forced. Play does not become play anymore if it is a forced project. Young children, especially toddlers, can lose their attention span very quickly and start on something and never finish. This doesn’t mean they didn’t enjoy it at the time, but more that they have just become disinterested for the time being. The more you turn imaginative play into a chore, the less you are nurturing their creative side. As a parent, sometimes it can be difficult to step back and watch your child get messy or play in a way that seems impractical to you, but this is how they learn best. Encouragement is key and with plenty of opportunities to play, your child’s imagination will grow and flourish.